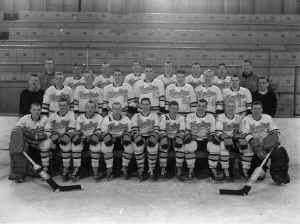 Calumet Hockey Association (1969-1992) Coach, Manager, Board of Directors, Secretary, President, Scheduler; Calumet High School Hockey (1969-present) Official Scorer and Statistician; Michigan Amateur Hockey Assn. (1971-1974) Board of Directors; Copper Country Chiefs (1971-75) Board of Directors, President, Official Scorer and Statistician; Lake Superior High School Hockey Conference (1981-2001) Statistician; Upper Peninsula Sports Hall of Fame (2001-present) Council Member; Great Lakes High School Hockey Conference (2002-present) Statistician and member of the Society of International Hockey Research. Bob is a walking book on hockey in the Copper Country; a great resource for this web site! Thanks Bob! As part of the Copper Country Hockey Centennial project, Bob was interviewed by the Keweenaw National Historical Park; this tape is in their archives. Anthony J. 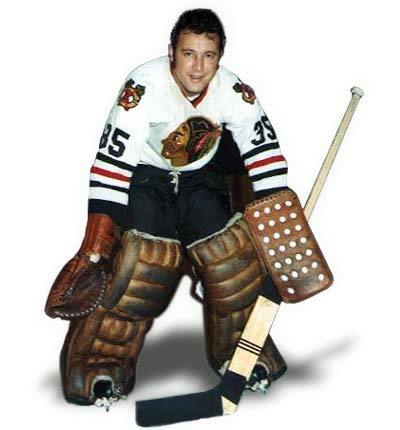 "Tony" Esposito, born 1943 in Sault Ste Marie, Ontario; Tony played goalie for Michigan Tech University for 3 seasons, 1964-67 (Freshman did not play in varsity college hockey games at that time at MTU.) 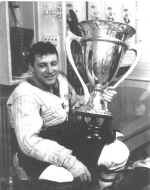 While at Michigan Tech, he was selected for many honors: NCAA Championship All-Tournament Team 1965; WCHA First Team All-Star 1965, 66, 67; and NCAA West First All-American Team 1965, 66, 67. Tony is still the MTU career leader in goals against average (2.55). He went on to play Pro Hockey with the Vancouver Canucks, Houston Apollos, Montreal Canadiens, and from 1969-84 for the Chicago Blackhawks and then 2 years as general manager of the Pittsburgh Penguins (1988-90). 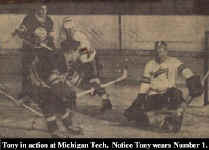 In his early years, Tony and his brother Phil, spent summers coaching the hockey development schools at the Soo where many local boys improved their skills under their tutorship. Tony was awarded many honors while playing in the NHL: he won the Calder Memorial Trophy 1970 (Rookie of the Year); NHL First Team All-Star 1970, 72, 80; NHL Second Team All-Star 1973, 74; and won the Vezina Trophy (Goaltending Excellence) 1970, 72, 74; and participated in 6 NHL All-Star contests. Tony played a total of 886 games in the NHL, winning 423, losing 306 and tied another 152. 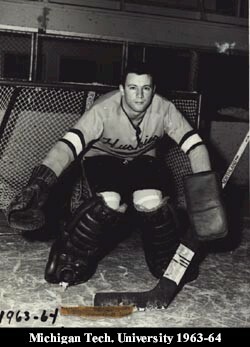 He also earned 76 shutouts to place him among the all-time leaders. Tony was inducted into the Hockey Hall of Fame in 1988: he is one of only six college hockey players who have been inducted into the HHOF. He is also a member of the Michigan Tech Sports Hall of Fame. He now works with his Hall of Famer brother Phil Esposito, as Director of Hockey Development and Scouting for the Tampa Bay Lightning. Seated L-Rt: Rick Best, Bruce Riutta, Terry Ryan, Pete Leiman, Al Holm, Rick Yeo, Dennis Huculak, Fred Dart, Tony Esposito. 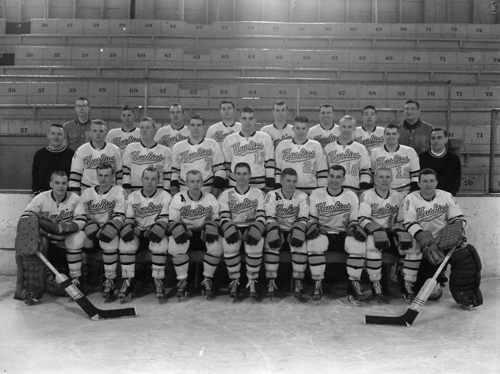 Middle Row: Assistant Coach Bill Lucier, Gary Milroy, Bob Wilson, Bob Toothill, Bob Brooks, Tom Steele, Roy Heino, Wayne Weller, Head Coach John MacInnes.